Yep, I'm creating a monster. I realize that I've caved, given in, turned into a tower of jello, but it's been a very stressful month for a very fearful dog. ... and that would be a lot of jello. It has been raining since June and it is now Mid July. No not every minute, this is Florida in the Wet Season and we don't need an Ark. I don't mind the rain, and neither does Rack. The problem is the Thunder that comes along with it. Many dogs are terrified of Thunder. Thor using his hammer making the world quake occasionally is bad enough, but this is the Land Where Thunder is Born. They shouldn't have named the place after flowers. Thunder would be a better name at this time of year. Or at least Rain. Rack being a fearful dog on a good day hides most of the day away now. I'm only 2 miles from the ocean here. There are usually storms Just Off Shore before the dawn, and sometimes they roll on land to water those flowers and make more pet mosquitoes so people can swat them and curse them by the pool and wonder if Mr Burns wasn't right in putting a Dome over Springfield. No, really, can we build a dome? Pump it full of DDT? I'll even let people leave. Well, Most people anyway. Do take your pets. The termites will be gone too. Maybe in an alternate universe we can all slide in and have no mosquitoes to feed the birds. None of that helps my Rack in the corner vibrating in fear as the windows vibrate from a lightning strike that hit my block. I get him out for the walk if the lightning is more than 15 seconds away. While lightning can strike anywhere within 5 miles of the actual cell, I'm thinking that I don't make as appetizing a target as those power towers that run up and down Dixie Highway or the Shoppes do. 15 seconds are 3 miles, roughly, at 5 seconds per mile between flash and boom. Dutifully I check radar on the computer or phone, set out plenty of water, some food, and hope beyond hope that Rack will "Grow a Pair" and eat breakfast. We get back in after a terrifying walk around the block because deep rumbling too low for me to hear means that there was a thunderstorm on my planet. Rack was vibrating at the door to get in and he literally bolts for his crate, his corner under the table, or his bed. And there he will stay until the rain stops. Or until the next walk comes and I pick the little guy up and carry him to the door shivering to take him out again into that steamy noisy hell-hole that I call my street. Scare the hell out of your dog week happened in the middle of all of this chaos. You may call it The Fourth Of July instead. Rack hated it. He wanted to be anywhere else. I sat in my house on the actual night of July Fourth in a smaller version of my own war video. Surrounded on all sides by Rocket's Red Glare, whistling, and of course the report of a mortar being fired followed by an airborne explosion. None of this was amusing to a fearful dog. He skipped a meal that day and the next. 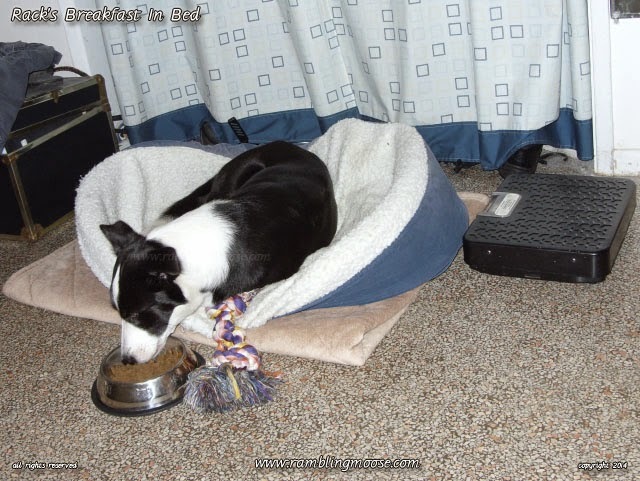 I was able to get him to eat the prior night's bowl of kibble mid afternoon on the next day. Forget the second bowl, they were back at it firing off rockets to scare off the evil demons in the sky, or the British, or just to have a Bit Of Fun. The next day when it was only rain, I found myself wandering through my neighborhood wondering what was wrong. Some sort of post holiday post traumatic stress disorder expecting explosions and whistles and general chaos was going through my own mind. I know Rack saw it the same way. Slinking from tree to shrub, he worked his way around the block. He didn't stand tall that night. We did make it home in one piece, and it seemed to relax him that there were very few fireworks being shot off. Vacationers perhaps, getting rid of a joyous armory before going back to a more sensible city where such things weren't allowed. Luckily it has been getting quieter. The storms were at a better time of day for us. Rack even managed to get a meal in without running for cover. But that schedule thing? Nope. Not really going to work out. I started helping him out. Rack would hide, I'd give him his space. After a while, I'd bring him his bowl. If he ignored it, I'd crumble a cookie or three into the bowl. Spoiled brat that he is, he is now accepting it for normal-ish. I'd put the bowl by his bed. He would melt into the bed and prove that the McNab Dog is versatile, but can be lazy at times. Yes, he would just roll his head over to the bowl and eat. Why not, who wouldn't want breakfast in bed? In this case Breakfast was being started at 10PM. Yes, time for breakfast at night. While a dog won't necessarily starve themselves, they certainly will make you tear your hair out while you worry about when they will get around to eat sometimes. We've worked out an agreement. I put out the food. He ignores it and eats it in his own good time if there isn't anyone firing off fireworks or having celestial flash-booms in the area. If there are, it may get eaten and I can obsess over timing regardless. Silly lazy mutt. Melting into the floor won't help, but I will put the bowl there when you need it.